Welcome to my online garden! I can't take you into my garden in person but I'll do my best via online bytes. Gardening is as much fun now as it was when I started over forty years ago. I am a new gardener every time I step through the gate and onto the mulch; it is always a wonder. 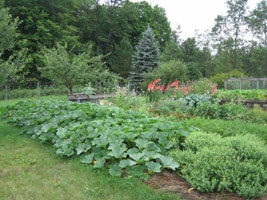 As a long-time organic gardener, I enjoy a cooperative and simple approach to growing food. I garden because it is my passion; it is also our food. I plant open-pollinated seed and most are heirlooms. They have earned their spot in the line-up in my garden and in generations of gardens before mine. Those I don't grow myself I buy from independent seed companies specializing in open-pollinated varieties. We usually have a 75 to 90 day frost-free growing season, though there have been years when it has dropped below freezing every month. There really is no such thing as a "usual" year. Sometimes we get the hottest, the coldest, the wettest, the driest all in one season! It makes for very interesting gardening. I love the changes. I've been fortunate to be able to share gardening adventures with people over the years through my writing and presentations, learning from them as much as they learn from me. 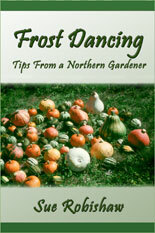 I hope you will find encouragement and information here that you can use in your own gardening adventures. Gardening is certainly one of my passions and it keeps me well occupied, but summer is full of other fun and interesting things to do so I've been looking at reducing some of the chores that don't please me so much, such as keeping the surrounding vegetation on its own side of the line I've drawn between garden and mowed area. ** We've tilled around the garden, I've mulched around the garden with various materials, I've let it go and then spent hours pulling grass and sorrel roots out of the garden beds. There had to be a better way. One was to put in a barrier and this year we finally did that. Well, I decided and Steve did the putting. Most trips to Escanaba included a stop at Menards to pick up our quota of 20 inexpensive paving blocks. That was all we could safely haul in the Prius at one time. The stack grew and grew until Steve finally did the job, first along the south border in front of the raspberries. That seems to be working well so he dug in and went up along the east edge along my new Border Barrier Bed. (the west edge is waiting for more pavers to arrive, and the north border will likely wait until next year). Years ago I had a patch of rhubarb growing behind the compost bins between them and the yard. It did a great job of keeping the grass back by heavily mulching that space with their large, thick leaves. I figured rhubarb had to be the ideal barrier plant but I really didn't want THAT much rhubarb. Surely there were other plants that would do, so the idea of a border barrier bed grew. I researched possibilities, imagined outcomes, made lists, bought a few plants but mostly ended up using what I had. 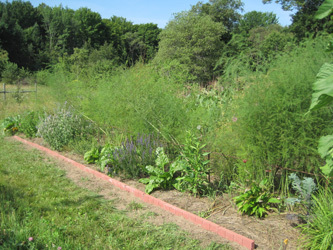 One of the most challenging areas was along the asparagus bed which is along the east side of the garden. The grass and sorrel loved to make their way into that fertile soil and it was hard to get out. So I made a new adjacent bed, taking some of the asparagus space (there was more than we needed) (asparagus does not give up its space easily I soon found!) along with the current path, digging, raking, weeding, reconfiguring the space to suit me - 6 feet wide, half of the width for the asparagus, half for the new bed - so I can easily reach across to care for both from their respective sides - 45 ft long. I filled the new bed with plants that will spread out to mulch their space but not spread so much as to invade the asparagus. At least that's the plan; we'll see. Some plants will take a few years to spread, others are already doing their best to fill their space. Mainstay and king of the mulch-barrier-plot Rhubarb is at either end, in-between sits Oregano, Russian Sage, Borage, Catnip, Tarragon, Stachys, Hyssop, Helenium, Coneflower, Lemon Lillies (these I know will need to be thinned often to keep them in their space - they are amazing spreaders!). In between all I planted annual Chard and Broccoli to help fill the spaces as the perennials grow. Chard is doing a great job and may end up being a permanent resident. But I decided to help the barrier plants by putting in the extra paver block barrier. Thanks to Steve it actually happened. I like it. It looks a little more formal (in a homestead kind of way) than I'm used to but I know it will "rough up" in time. All the plants in the bed are sturdy, simple, varieties that don't require a lot of fussing and care and are all pollinator friendly, which was a requirement when choosing what to plant. I'm finding the asparagus isn't giving up easily and I'm 'weeding' it out of the new bed as much as I am the resident regular weeds. Disturbing the ground by digging and tilling is a sure bet way to grow a great crop of new weeds! But I know this will abate as the new area settles in. **So what does one call a mowed area that isn't the traditional 'grass lawn' that most folks think of? We don't have that kind of lawn. We have mowed vegetation. We have not mowed vegetation. It's all a great diversity of plants, all sorts of plants and I'm working at adding even more. Some areas I mow, some I don't, it's all the same; field or lawn, wild or tame; inside the fence or outside the fence; around the garden, across the orchard, around the house (or on top of the house!). I haven't yet come up with the best words for the mowed areas and the not mowed areas of our homestead. If you have some ideas, let me know! I enjoy looking back at last season’s garden but mostly I’m looking ahead to the coming season. What do I want to change, what do I want to do different this year? Some decisions I don’t make until I’m standing in the garden with plants or seeds in hand, looking for a good spot for this or that, or a bit of extra room for just one more whatever. But I do write out a general plan; it helps me to have an overall idea. Most of what I grow has settled in nicely based on many years of what we like, what we eat, what grows best, what works here. But there’s always room for something new. And my biggest change this coming season will be to add more flowers and herbs and to mix things up a bit. Nothing exotic, just something more for the pollinators, and for fun. I’ve been swimming in a sea full of ideas for the orchard, adding diversity, looking for understory ideas for the fruit trees, growing towards what some are calling nowadays a “forest garden”. And I realized I could easily do more of that in my vegetable garden. The two aren’t really separate, the roughly 50 x 80 ft vegetable plot being in the middle of the orchard, with berries in both, but on paper they are separate. And on paper my vegetable plot is very organized. 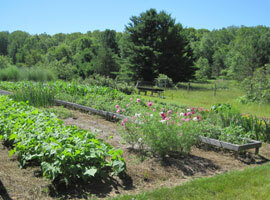 Some things even stay that way in the garden -- corn, squash, potatoes, tomatoes tend to be in their own 4 x 32 ft plots. Except for those that end up elsewhere, leftovers when the main plot is full. And mostly the other crops are in smaller blocks, one next to another. It’s not that I don’t care for the companion planting idea, or ideal. It’s a practical thing, that often has to do with frosts. I’ve had decades of having to suddenly cover tender growing plants when that late, or early, or mid summer frost is forecast. And I have a supply of old blankets stored in their own mouse proof cabinet ready for the task. And I have learned that it is much easier to cover the plants that need protection if they are all together in one space and not scattered here and there. Been there and done that! One does get better at these things. There is actually plenty of diversity and interaction in my garden. When things get growing I can hardly get through some of the paths between plots, supposedly there to walk through. It can get to be quite a wonderful jungle. So why mix things up more? In some cases because it will work better for me. Snap beans planted in one row along the edge of a plot with something else in the middle is easier to harvest than a large block of beans, though a block works well for the dry beans since I only harvest them once. And spinach definitely likes to be singly along an edge. Coles don’t mind being in the middle, nor do flowers, at least not the simple ones I grow (zinnia, marigold, calendula, cosmos). Lettuce can use more shade mid summer so maybe I’ll put some plants amongst the corn. I’m a bit tired of the herbs being in one block and most need to be divided anyway. I think they need to be spread out so one can appreciate them more as individuals. I’ve started transplanting some out and around and I’ll do more of that and throughout the garden. I think the vegetables will like that, too. And why not plant more flowers for the pollinators? I sure do appreciate them. I’ve ordered borage and nasturtiums. It’s been a long time since I’ve grown either of those and it’ll be fun to have them again. One of my favorite flowers is buckwheat. It’s an easy summer loving crop, and I plant a little here and there as space permits. The bees and such love it. I let it flower then cut it down when it starts setting seed but there’s always plenty of volunteers around. It does grow large and rank, and I doubt anyone would accuse it of being sweet smelling but if the bees like it, I like it. And I let the broccoli flower for the bees as well. 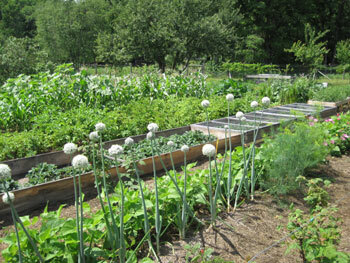 Many of the common garden vegetables are beautiful “gone to seed”, or flower and well loved by the pollinators. It’s not a traditional flower garden by any means, nor the carefully designed permaculture/polyculture system that seems to be all the rage nowdays, but something that suits my practical side, my busy summer schedule, my love of lightly organized wild. I think it will be a fun garden, and I have no doubt it will feed us well as it has for almost forty years. A new year is here with infinite possibilities! There’s nothing quite like imagining working (playing) in the garden to warm you up on a cold winter’s evening. It may be zero degrees outside but in my mind it’s warm and sunny with green things growing all around as I look over my garden plan. What happened this past season? What worked, what didn’t, what seeds do I need to grow out this coming year, what do I need to buy? And I wonder anew at the abundant food that garden gave us. It’s always amazing but this year was over the top for some of the more heat loving crops. Every year is different; that is one thing I can always depend on! And this past year it was record warmth. I usually figure, roughly, a frost free growing season from about the 2nd week in June till the first or second week in September. This year we had a mild spring, with a last frost mid May, then just one freeze June 7. Then we didn’t have another frost (freeze actually) until October 9. In between was unusually warm with plenty of rain. The corn and squash were beside themselves with joy and enthusiasm. And the sunflowers turned into trees that I almost had to get out an axe to cut down. The squash I grow is a relatively short season buttercup variety I got from Kathleen Plunket-Black of Plum Creek Seeds, a long time and very experienced seed saver in Arkansas WI. It’s rich, sweet and nutty, and I usually get a reasonable crop with maybe half the fruit maturing before frost. So I plant with that in mind. But this year not only did the vines grow with abandon setting fruit right and left (thankfully along the edge of the garden so they could sprawl out over the grass), every single one, except for one half grown late specimen, fully matured. Wow, did we have squash this year! I make a bit of squash soup but our favorite is to have plain cooked squash with our luncheon salad, almost every day. We never tire of it. By contrast, two years ago we had a long, cool, wet spring and early summer. Fruit set was poor for many crops including the squash and cucumbers. The harvest was sparse to pathetic, and the big question among gardeners was “did you get any cucumbers? any squash?”. It was a rare one who did. Not even zucchini. Then this year one could hardly give cucumbers away. It was the year to make pickles for sure. I didn’t have any trouble finding homes for the extra winter squash though. It found its way into many a Thanksgiving dinner for which I was very thankful. Make hay while the sun shines, as they say, and eat squash when you have it. We do, and we are, along with a very appreciated abundance of other vegetables.